The decision was first instigated by a check by a local transportation prosecutor on materials mailed from the United States to the Siberian city of Surgut, which has been a site of conflict between Scientologists and the Russian authorities in the past. 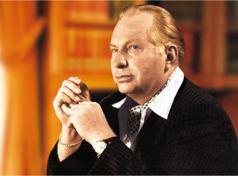 A variety of audio and video recordings and books by L. Ron Hubbard were discovered among the materials, and the prosecutor’s office ordered their confiscation for psycholinguistic analysis. According to today’s press release on the Prosecutor General’s website, experts concluded that Hubbard’s include both direct and veiled calls to instigate social strife, to rise up against state agencies (the judiciary and law enforcement in particular), and to commit violence motivated by ideological and religious hatred. “Specialists in the fields of psychiatry, psychology and sociology concluded that the materials presented for analysis are not acceptable to distribute, as they undermine the traditional spiritual basis of the lives of citizens of the Russian Federation,” said the press release. Russian law dictates that materials deemed extremist must be included in the federal list of extremist materials that are banned from distribution on Russian territory. While it isn’t entirely clear how many Russian citizens adhere to the Church of Scientology, the government has been aggressive in attempts to ban the organization. Most of the time it has been shot down by the European Court of Human Rights, which ruled in September 2009 that two Scientology branches in Surgut and Nizhnekamsk could not be denied registration as religious organizations. The Russian government was forced to pay a 20 thousand Euro fine and was prohibited outright from banning the Church of Scientology. Given that Scientology is controversial in countries around the world, Russia’s ban on Hubbard’s works may bring more attention to Russia’s questionable methods for determining just what constitutes extremism. Opposition activists and human rights groups have repeatedly suffered from accusations of extremism, and argue that the definition as given by law is so vague that it allows state agencies to effectively ban whatever groups they deem to be undesirable. In particular, the Russian Internal Ministry’s notorious Center for Extremism Prevention, commonly referred to as Center “E,” has been criticized by oppositionists and rights groups worldwide of torturing detainees and conspiring to hinder lawful acts of political protest.